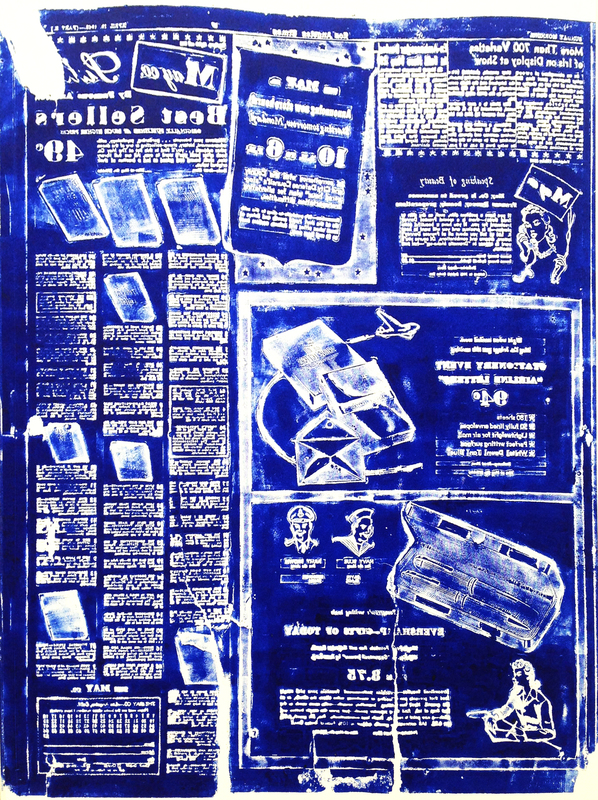 The words are simply an image, and if one puts her or himself far enough from the paintings, one sees: newspaper text, ingredients, huge kinds of brushstrokes and even digital cancellation signs. Laura Owens is interested in “the picture within the picture”, bending, therefore, many elements to her expressive needs. 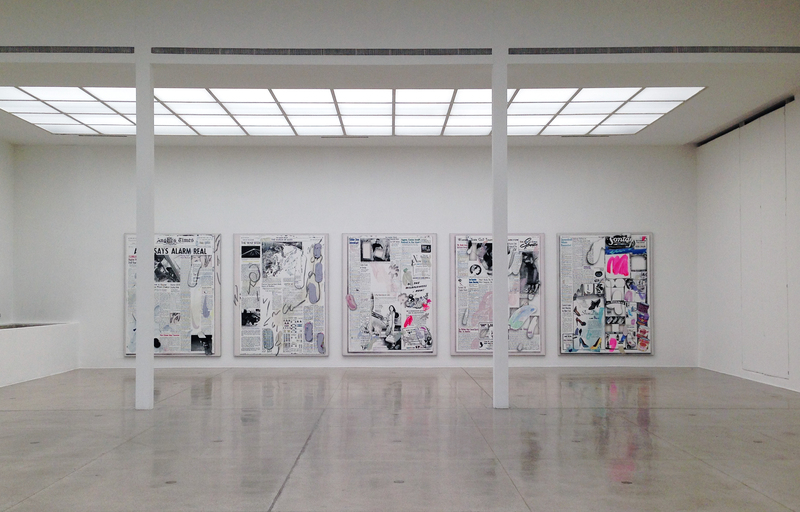 And in front of these works, (all works are Untitled, 2015), there is a black one, with a sort of collage of images and a few brushstrokes on the top. She is thus interested in the time honored relationship/interaction between a painting and the viewer. But how do I perceive a painting seen from 10 meters away? And how about from 1 meter away? 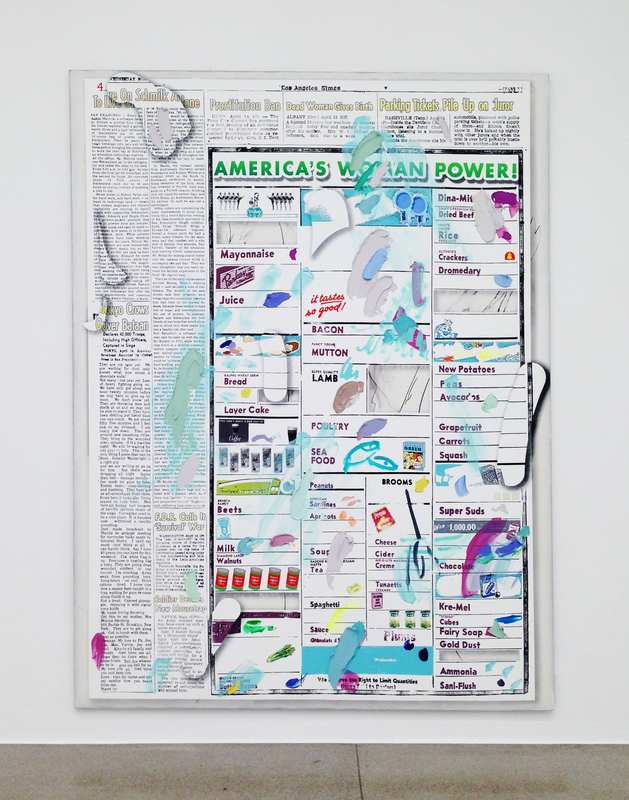 The press release states:”Owens also regards painting as a medium of spatial and bodily experience. She often arranges her pictures to initiate a dialogue between her art and the exhibition space with its specific architecture”. Generally, it is like in Impressionism, says Owens in an interview with Maco TV: far away one sees the image, from close-up one sees the brushstrokes. Brushstrokes indeed and digital cancellation signs both seem to be the Leitmotiv of this exhibition, together with the element that is shared by all the works: newspaper pages. The artist has been working for several years with vintage newspapers from the 1960s such as The Los Angeles Times and The Berkeley Barb. 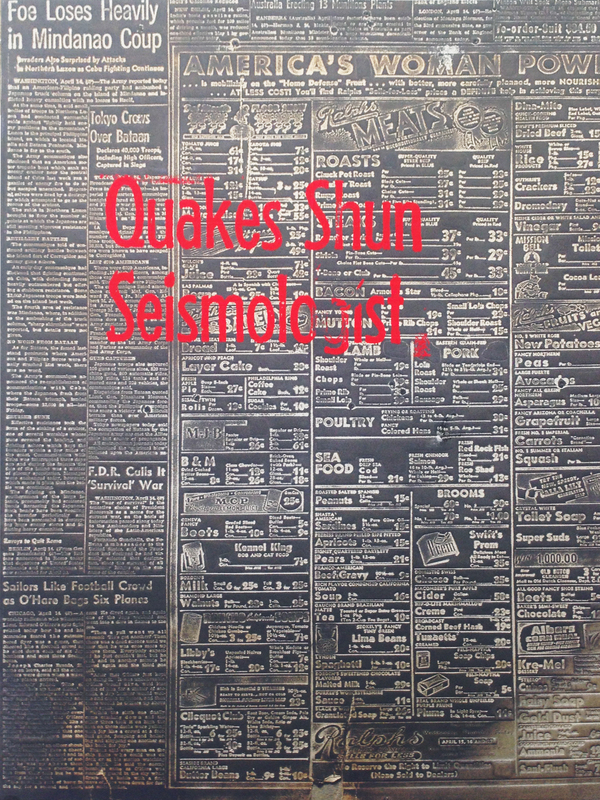 She, “found a set of newspaper stereotype plates that had been repurposed as flashing beneath the shingle siding of her Echo Park home in Los Angeles. These paper negatives were originally made to cast the lead cylinders used on press, and all came from editions of The Los Angeles Times printed over a one-month period in 1942 – the year the house was built. Owens was struck by the juxtaposition of work events in the months after Pearl Harbor alongside fait divers from a bygone era in her own neighborhood. To begin working with these images, she had rubber casts made of the original negative plates in order to make prints.” (Excerpt from the press release). 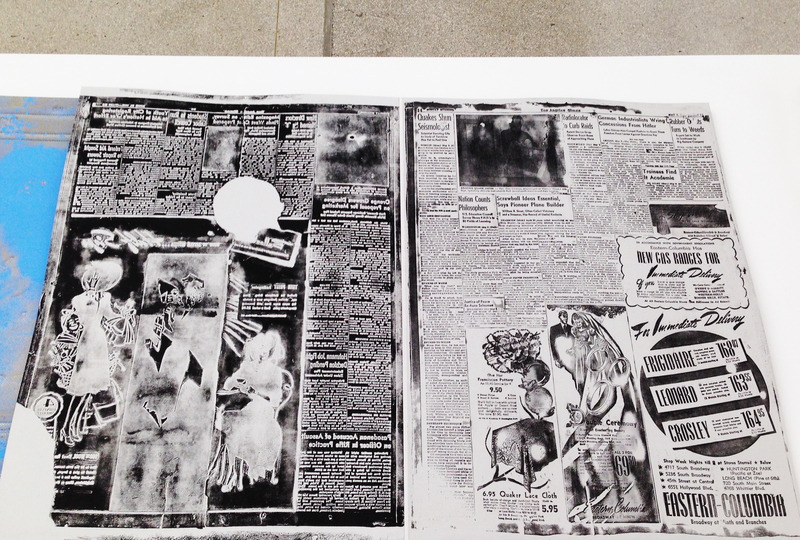 Information provided in relation to the exhibition lets the viewer know that the scans of the reprinted newspaper plates were edited in Photoshop before being screen-printed on canvas. The color/brushstrokes are few and moderate, as if their appearance where by chance. This has something to do with the lightness mentioned before and with Owens’ statement that an artist must not dogmatically try to make good art. Although with this “anti dogmatic” idea, these works appear very “well educated”, quite homogeneous in relation to one another. 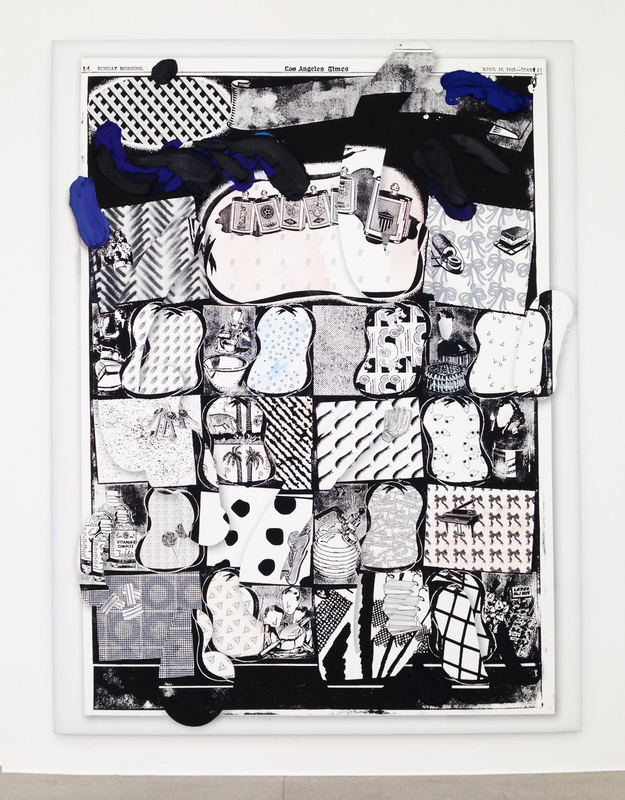 The cornucopia of elements that create Laura Owens’ practice and poetic language is readable with lightness – it is very direct and despite the fact that the viewer is not “assaulted” it goes deeper and one can notice and enjoy her complex process and practice as a result. The exhibition, in wider terms, is a little bit too balanced, particularly univocal, perhaps too homogeneous as it were. It is not precisely what I expect from an exhibition, but nonetheless remains an enjoyable viewing experience.